It occurred to me the other day that, in the seven years or so of banging out Repman copy, I've probably written more than 2,000 original blogs. That's borderline prolific and, if one knew how reticent I was to engage in blogging way back when, more than a tad ironic. In those hazy, crazy, anything-but-lazy early days of blogging, I was encouraged by Peppercommer Andrew Foote to take the plunge and become our firm's guinea pig. I felt a bit like Scott Carpenter, John Glenn, or one of the early Mercury astronauts since I knew next to nothing about the new medium. But, having served an apprenticeship at CooperKatz and worked alongside the uber blogger of the day, Steve Rubell, Andrew knew his stuff and proved to be a superb coach. – Create an original and memorable name for the blog. – Carve out a particular area of interest (image and reputation). – Develop a particular point of view. – Post comments on the few, established blogs of the day so their authors would return the favor by posting comments on Repman (and bringing along their readers in the process). – Write in short, concise prose. – Commit to writing a blog each, and every, day. – Be edgy and outspoken. – Never let anyone ghost write your blogs and never invite guest bloggers to post on your site. I must say that, with one notable exception, I followed Mr. Foote's advice to the letter. I've written blogs that, I've been told, have inspired others. I most assuredly have penned others that have incited controversy. One even led to my being fired as an awards' judge by PR Week and another provoked a holier-than-thou client to end his relationship with Peppercomm (although the account team assured me that was merely an excuse and the client had, in fact, run short of funds). 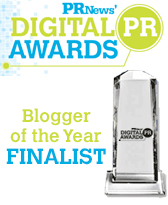 I've been twice named blogger of the year, have had my content re-published by PR Daily News, O'Dwyer's and have been cited numerous times for having written the CommPRO.biz best blog of the week. The Repman blogs have led to bigger, and better, opportunities. I'm proud to say I'm now a regular contributor to 'Page Turner', the Arthur W. Page Society blog. And, I now author twice-a-month columns for Inc. Magazine. Andrew Foote played the role of the patient father who convinced his wary son to try and ride the bicycle without training wheels. And, once I'd gained my balance, I began pedaling faster than a blood-doping Lance Armstrong. Oh, as for Andrew's one piece of advice that I've ignored: inviting guest bloggers to contribute content. Rather than water down Repman's, the guest bloggers have brought fresh and, at times, radical thinking that has only made the site improve over time. And, I've been blessed to have contributors as young as Chris Piedmont of the College of Charleston and as wizened as my co-founder Ed Moed (whose guest blog on measurement was just cited as a best of the week, thank you very much). So, here's a long overdue, virtual hand for Mr. Foote. If hadn't been for your advice and encouragement way back when, I'd probably still be sitting on the sidelines and unable to provide first-hand counseling when a CEO tells me he's way too busy (and doesn't have enough fresh ideas) to write his own content. Perhaps I should been more discretionary in heeding Andrew’s advice, KensViews? Steve, you REALLY should have followed Andrew’s advice about never inviting guest bloggers to post here! Steve, thanks for the shout out (and for bringing the Foote puns back into the mix!). It was easy for me to suggest these things. It’s a much harder thing to build a voice online and grow it over the years — a rare talent many have tried, but few have done well. Kudos to you for continuing to publish a unique perspective each day. Keep going.